I’ll also do mini reviews for each product in this post. You can find reviews of most products here. Strawberry body butter – one of the newest products with me. I’m loving it lately, it’s fragrance is all the time in my room these days 😛 I just reviewed this in detail some time back. You can view that post here. Olive body butter– This is a very rich moisturizer. It’s really good for extreme winters, my mom loves using it especially coz the scent is so so calming and fresh. Olive body scrub – this has been reviewed in detail long back here. My sister and mom love it so much, they bought a new one in my absence. This really is a cult favorite of ours from the brand. 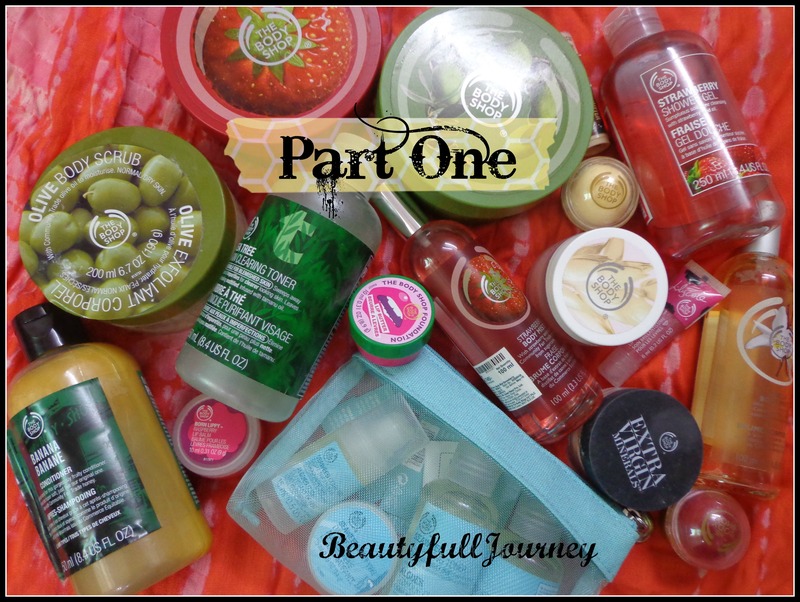 Strawberry shower gel – reviewed this long back here. I was so glad to get another bottle of this recently as a gift from TBS. It’s my all time favorite shower gel! Strawberry body mist – another new product in my stash. This is my least favorite amongst the strawberry products I have. Its not bad, but the scent of strawberry in this is a bit different from the butter and shower gel and I like it a littleee less. Vanilla body mist – I loveeee this one! I really want to take this with me to Chicago as I love using this. But the glass bottle looks too dangerous to me. This is one of the few scents that last really long on me. Reviewed in detail earlier here. Seaweed skincare starter kit – although I bought it in the US and use it there but I like to travel with it so including it in this list. It’s a nice range, I particularly like the night treatment a lot. I’ll review it in detail soon. Tea Tree toner – another old product in my stash. I really liked it when I bought it but after some time it kindof stopped working for me so I have mixed views about it now! Maybe I’ll try the whole range sometime again in the future! Banana conditioner – I bought this alongwith the shampoo really long back, my mom and sis have already finished the shampoo but the conditioner is hardly touched. But I love the conditioner more than the shampoo. It’s a light conditioner but good for summers as it doesn’t weigh hair down but gives decent hydration. Cocoa butter lip balm – one of my favorites but I had completely forgotten about it and it has expired now I think. Review here. Dragonfruit lip butter – another favorite. I love most TBS lip balms, they’re so much fun 😀 review here. Vanilla Bliss & Cranberry Joy holiday lip balms – these are limited edition lip balms. I loveeed using them. Mine are almost flat now but I still enjoy them a lot 😀 Reviewed here. Born lippy strawberry lip balm – one of the first products I ever got from TBS. has expired now and I threw it out after this picture 😀 I don’t like it much as it did nothing for my lips! Extra Virgin Minerals powder foundation – this is a fairly recent purchase and I got it at a great price. It’s a great loose powder and feels really good on my skin in summers! Lily cole collection lip gloss – I loveeee this lip gloss 😛 esp its fragrance !! Full review here. So that was Part 1 of my collection! I’ll be back soon with the second part! < Previous Carmex lip balm Review| Best lip balm ever |Multitasking lip balm. Next > The Face Shop Mini Pet Floral Hand Cream Review.